TobyMac’s Solo Records Ranked Six To One. #1: This Is Not A Test | NoCoda. I’ve struggled with this. I really have. 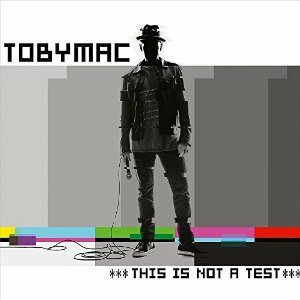 I’ve tried to take a step back and convince myself that I’m just really digging the newest TobyMac record because it’s in a whole different class than its two predecessors. But….it’s better than Portable Sounds….really? Better than Momentum? No more debating; this is simply what it’s come down to. This Is Not A Test is the best record that Toby has put out in his solo catalog, and seeing that it’s currently twenty-fifteen, no one is more shocked at this turn of events than me. In another baffling twist to this reviewer, this record is also the poppiest (though very upbeat) thing he’s ever done, and I’m still claiming it for his gold. Right off the bat, I have to make the simple case for the following: everything has been done before, and nothing is original. The influences on some of these tracks are undeniable, and while we’ll get to them specifically in a moment, I feel that the argument that this is just the faith-based industry capitalizing on what may already be popular in the mainstream market is not only irrelevant, but misguided. Do you think Justin Timberlake would be anywhere without Michael Jackson? Do you think Bruno Mars has never heard of Little Richard? Mars’ debut was called Doo-Wops & Hooligans, for crying out loud! Even OneRepublic, whose hits fall over the map, have a common thread of aspiring to the “high reaching” and “grand” sound that U2 has made famous (I read that last one somewhere once – I won’t claim it as an original thought). All of these artists have influence on This Is Not A Test, but they don’t sound like rip-offs. They don’t sound like common beats that we’ve heard countless times before on your local Top-40 station. They sound like inspired ideas that have been polished clean, and have elevated this record to a level that this broken, faith-inspired industry hasn’t seen in quite some time. We might as well start off by tackling the fifty-percent-Justin / fifty-percent Bruno beast that is Feel It, the record’s obvious choice for a single (it was actually the second single released after Beyond Me, but no matter). This thing is a tour de force that jumps from a crazy funky horn section to a talk box breakdown (performed by, none other than Mr. Talkbox) to a no holds barred finale that lures you in with a brief second of silence before exploding with a slapped bass and Michael Jackson-style outro. This thing has more party packed into it than a can of sardines. It doesn’t stop there. This record is overflowing with wannabe singles. Backseat Driver very well might be the catchiest thing Toby has ever put to tape. It’s somewhat comical that Toby is actually featured less on the track than his guests, one of which is his son Tru (he’s now sixteen; no more kiddy verses, thank goodness) and the other is a new Gotee records signing – nineteen-year-old Holly Miller, aka Hollyn. It’s a crime if this thing doesn’t get picked up on mainstream radio, because this beat — a slick guitar lick backed with a killer chorus of some deep, aquatic bass thumps and a perfect four-note saxophone blast — is chart topping gold, and would fit in seamlessly with today’s market. Hollyn’s vocals steal the show with a hook that is full of complete power, but is perfectly balanced. I want to tell you that if you can only listen to one track here, to make it this one. I can’t do that, though! There’s so much other goodness here! Light A Match. Beyond Me. Lights Shine Bright. Listen to those three, in that order. Each is completely distinctive in its own right, deeply rooted in the pop-vein, and equally accessible and overwhelmingly individual in its makeup. I don’t feel like I hear stuff like this on the radio, and at the same time, I believe that they would fit in flawlessly. Even a southern work-song like Move (Keep Walkin’), with its baritone chant, could absolutely make its mark. Now, I do hear the likes of the title track on the radio – no doubt. This Is Not A Test is pure EDM (it features Capital Kings, after all), and hits the nail on the head in style without driving it in and through the proverbial board. The same could be said of the OneRepublic-inspired Love Broke Thru, with Toby’s vocals layered about fifty times over on the chorus to make it a powerful experience. It’s lyrics are on-point and to the heart: When love broke thru / You found me in the darkness / Wanderin’ thru the desert / I was a hopeless fool / Now I’m hopelessly devoted / My chains are broken. Faith-inspired music gets muddy when lyrics try too hard, and it’s not that that they’re non-existent on this record, but the pros highly outweigh the cons. My money is on Til The Day I Die for the next single. Smooth fist-pumping electro-rock with a monster post-chorus beat drop and an authentic verse spit by newcomer hip-hop artist NF. Now, I want to make sure that you, reader, are aware that I am aware of the verbiage that I just used. Terms like “beat drop” and “spit” are ones that don’t easily come off of my fingertips in the same sentence when writing a positive review of a record, because I tend to stray from away from the effortless combining of the two that runs rampant on the airways nowadays. Not the case here. Til The Day I Die is pure gold. Undeniable is a sonically beautiful ending to the record, closing it with a worshipful tone and a mature-beat. My only complaint is the children’s chorus and music box effect that comes late in the song, using an overdone method to appeal to vulnerability – which hasn’t worked for me in quite some time. I’m brushing over this track quickly to get to the last song that I haven’t mentioned yet – Love Feels Like. Not only does the track feature Michael and Kevin, but it sounds more like dc Talk than any of the previous four times the guys have recorded a track since their never-ending hiatus started in two-thousand-one. Let’s Roll (2002) was solid, but felt somewhat forced. The Atmosphere remix (2004) was certainly very dc Talk-esque, and while would have fit perfectly on a dc Talk record, lacked the grit that we yearned for in the Jesus Freak days. The Cross (2007) was an experimental, Prince-covered gospel track that was very worthwhile, yet invoked little nostalgia. Well, it’s been eight years, but Love Feel Like is as close to anything that we could have dreamed up. It’s the most rock-driven track on the record, which obviously fits into dc Talk’s style. Michael and Kevin sound right at home in their respective verses, and are superbly mixed with Toby’s more aggressive delivery in the chorus. If that wasn’t enough, about two-thirds the way through the track, the mid-nineties come in full force with warbled guitar riffs and record scratches that would make even Catherine Morgan get in the groove and nod her head. This Is Not A Test is unbelievably strong. It has legs that will make it a staple in the industry, and further, should take it outside the church doors and into the records shops and radio stations around the county. This stellar record is a must-own for those that enjoy huge pop hooks, uncompromising variety, and beats that will stand the test of time. Fourteen years after releasing his debut, the now fifty year old TobyMac (freakin’ fifty!) has released his best record. No reason to stop now, sir.